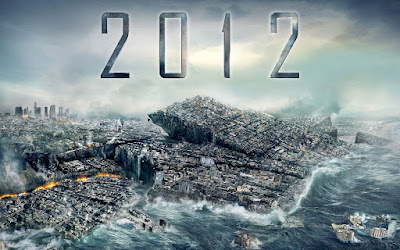 I came out of the cinema this evening quite blown away by 2012. It was the first thing that my eldest had wanted to see since his birthday in September, so a late treat, but worth it. The special effects are just stupendous. We were sitting in the second row so got the full blast, as it were, of the vastness of everything. The cinema was pretty packed and it was a good thing I'd reserved because I'm not sure we would have got in otherwise. The boys sat munching popcorn and drinking soda as the world was demolished before their eyes. The story is fairly simple. Divorced father of two kids finds out about the end of the world due to excessive sunspot activity and sets out to save his family including his ex-wife and her new boyfriend. I won't spoil it by saying who'is still standing at the end, but it's no particular surprise. I had some favourite moments. The first is when the family is in a Russian container aircraft full of luxury cars belonging to an oligarch. It's just about to crash and they all, including the Russian, his two boys and his chick, jump in a Bentley so they can drive out of the aircraft while it's still moving. The car won't start despite the hero's attempts with the key. Then the oligarch shouts for silence silence and says "Engine start..." the engine starts and he looks around and says "démarrage automatique, c'est ça qui m'a seduit" (yes, we watched it in French) with a beautific smile on his face. The second was when a whole load of world leaders and powerful types were filing onto the vessels, and the engineer hero looks at them all, including a sheikh with his entourage and asks what the criteria for entering on the vessel is. He's told it's a genetic advantage for rebuilding the world. He looks at the sheikh and says "what's his genetic advantage?" and is told "money". I chuckled at that one. I enjoy the simple pleasure of watching a disaster movie. This one doesn't have any great message, and some of the sincerety scenes are a bit predictable, but you do get a whole load of movie for your money. Recommended for breathtaking light entertainment.